A Fortune Magazine "top-25 very cool technology company!" Algorithm, Inc. has been a premier out-source product development firm for AI technology and algorithm-driven software for business, industry, commerce, aviation, entertainment and training for three decades, creating products for companies just starting out to those of the Fortune 500. 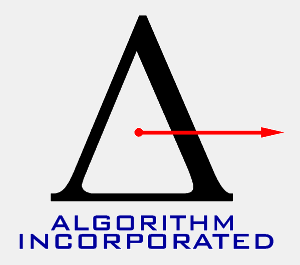 Algorithm, Inc. has performed work for such industry leaders as Thomson Entertainment (a division of Thomson Training & Simulation) and American Orthodontics, and through a related company produced API's for Intel Corporation. Algorithm, Inc. engineers PC and mobile software applications and electronics hardware for interactive real-time simulation and 3-D computer graphics, as well as many specialized data analytics technologies for business and industry. It builds software for data analytics and machine learning that bolsters Enterprise Resource Planning (ERP) solutions and inventory control and prediction. As on-line sales became important in the late 1990's, one such effort was for the furniture industry, where both demand predictions for inventory and specific-to-customer catalogs were created. One specialty is the creation of API's (Application Programmer Interfaces) and SDK's (Software Development Kits), affording other engineering firms and businesses the freedom to develop their own proprietary applications, saving them the steep learning curve of modern algorithm engineering. Founded in 1982 by Chairman and CEO Christopher D. Watkins and incorporated by him in Atlanta, Georgia in 1991, Algorithm, Inc. pioneered predictive characterizing control systems (now popularly referred to as "deep learning"), early plasma globes, analog and digital music synthesizers, special effects signal processing equipment, compression technology and signal-processing systems, as well as some of the first immersive simulation systems. Compu-Ceph® uses predictive control-system analytics, in order to predict the outcomes of orthodontic and oral surgical procedures. Algorithm's owner Christopher was recently granted U.S. Patent #9,245,148 (#8,700,890, DLA Piper LLP (US)) for a next-generation cyberdefense weapon (Secure storage and accelerated transmission of information over communication networks). See Christopher's Biography and the Books Written by Christopher for more details. Two sample books are available at Virtual Reality ExCursions and Modern Image Processing. The name Algorithm refers to the step-by-step procedure for solving a problem or accomplishing some end, whether technical or business. Algorithm's unique approaches to problem solving, backed by advanced mathematics and engineering expertise, have facilitated the development of workstation performance PC's for graphics, process control, and simulation. 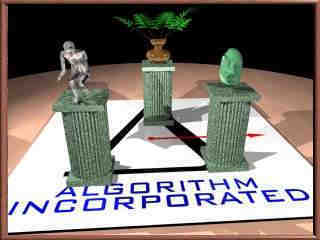 As The Algorithm Company™ and The Software Algorithm Company™, Algorithm, Inc. has combined its technical resources with industry partners to become the out-source Research and Development think-tank, investigation team and skunk works for many of its world clients, saving them the high costs of maintaining a full-time R&D facility. "I would endorse strongly Christopher not only in this endeavor, but any technical challenge he puts his mind to solving"
"he turned our project around in a remarkably short time and with precisely the results promised"
"In a world where things 'fall through the cracks' and deadlines are often considered starting points, Chris is a welcome departure"
"grasps new concepts instantly and has a firm grip on project reality both in terms of what can actually be done and how long it will take"
"a key player with exceptional leadership and technical skills"
We have been involved in practically all aspects of simulation and training, having diverse and pertinent backgrounds in military and commercial aviation, meteorology, mathematics, physics, human perception, electronics, signal processing, control systems, and educational curriculum development. We were involved in early barge simulation, flight and air-traffic control simulation. A business specialty has been the assumption of distressed projects, in order to bring them to stability. We keep the end results and customer use of the desired product in mind from beginning to end; such is essential to producing extensible, high-performance and low-cost products that actually address the needs of our clients and our client's clients. We know flexibility and innovation at the strategic design stage yields the best tactical development plans. And without reliance on the	assumptions of preset models, we integrate technological ideas from both the past and the present and from a wide range of engineering disciplines, using pre-existing tools where needed and inventing tools where needed. Much of what we do is well-crafted, never-before-seen solutions. In addition to invention capability, we mix proven technologies in ways typically unconsidered, and are careful to avoid getting stuck on one tree branch, when the answer is sitting on a nearby branch. Our method creates an optimal path to the highest quality products with controlled risk and reasonable cost.